Effective immediately, Quadrant is offering a laser-writable Polyoxymethylene product to the global engineering plastics market. The product is branded Ertacetal® C LQ POM-C and comes with full compliance to REACH, FDA and EU 10/2011 regulations. With this development Quadrant meets the food and pharma industry’s requirements for laser-writable machine components with no risk of contamination of the food products. These sensitive industries prefer laser marking over ink marking as it does not pose any risk of harm towards food and pharma products. Quadrant has developed this specific laser-writable Ertacetal® product since the standard POM-C natural grade does not show markings with common laser technologies (e.g. IR-YAG, UV-YAG). Instead, the surface of standard POM-C just experiences burning but no visible dark marking. 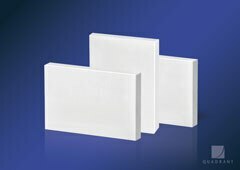 The new product shows identical physical properties and machinability as Quadrant’s standard Ertacetal® C natural [POM-C] product and is available in a bright-white, less transparent colour. Ertacetal C LQ POM-C is processed by extrusion technology and is available in dimension of 10 – 60 x 610 x 3000 mm. Stock items are available in the form of sheets in 25 and 50 mm thickness. Product Data Sheet, Product Handling Information Sheet and REACH documentation are available. Ertacetal® is a registered trademark of the Quadrant Group.